Silverware and stainless steelware can be made kosher through hag’alah [boiling]. The day before kashering, clean all the flatware and let it rest, unused, for 24 hours. Some flatware handles are made of a different material, such as Melmac (a hard plas­tic) or wood. You can submerge the entire piece, if it can withstand the heat. Otherwise, its kasherability is debatable. Some rabbis I spoke with said you can submerge just the metal part of the flatware; since you don’t eat with the handle, it doesn’t matter if it is kasherable or not. Others say the entire implement may not be kashered. Check with your rabbi. It also depends on how smoothly attached the handle is. If it seems loose, if there seem to be cracks or spaces into which food could enter, which would be very difficult to clean, you probably should not use it, and it should be replaced. This is also the case with knives, many of which have handles made of a separate material. The flatware pieces cannot touch each other, lest those parts touching not be fully ex­posed to the water, so this is a somewhat tedious procedure, especially if you have a lot of silverware. The Star-K organization [which overseas kashrut for food companies] recommends tying the individual implements to­gether in a sort of chain, with a few inches between each piece of flatware, so you can eas­ily lower them into the boiling water. Another option is a large net bag, as long as it is large enough for the flatware to spread out on the bottom of the pot in a single layer. The flatware should remain in the water about 15 to 30 seconds, and then be rinsed in cold water. Make sure you do not rinse it in an unkosher sink! 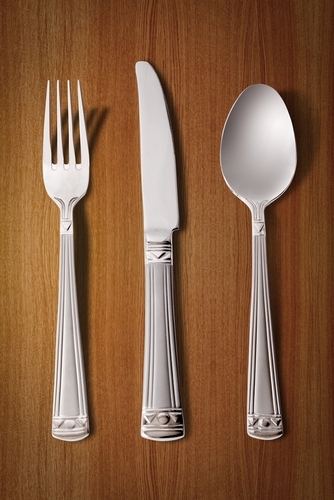 The rules for koshering flatware are the same for Orthodox and Conservative fol­lowers. As for other kinds of utensils, it again depends on the material. There are some made with newer materials, such as spatulas designed to withstand temperatures above 500°F, 600°F, even 700°F. These could certainly withstand hag’alah, but consult with your rabbi, as they are a kind of plastic. Wooden spoons can be kashered by hag’alah. • If, when cutting vegetables, you inadvertently cut a worm. What the preceding circumstances all have in common is that the foods are cold, or at least below yad soledet bo [“when the hand shrinks back from it” because of the heat–the point at which Jewish law considers a liquid hot]. Knives that you use for cutting hot meat, such as those that are part of a set of flatware, still need to be kashered through boiling, hag’alah. A serrated knife, however, because of its nooks and crannies, needs the higher heat of libun for kashering; that is, the knife has to be heated with a blowtorch until it is red hot. You may need to get a new set of knives. Many great cooking knives have bolted plas­tic or wooden handles; few are one continuous piece, and there is the real possibility that unkosher food might get caught between the various cracks. Check with your rabbi.